In addition to healing veterans, the Veterans Affairs Medical Center in Phoenix, Arizona, is also helping to heal the environment, with the recent installation of a 4.4 MW solar carport project that will displace millions of pounds of greenhouse gas emissions. Capable of producing 4.4 megawatts of renewable power, the installation at the Veterans Affairs Medical Center in Phoenix is said to be the largest solar carport installation in the U.S. The carport covers roughly seven acres, or the equivalent of just over five football fields, and it provides shade for all parking stalls—a total of 1625 vehicles—in an area of the U.S. where temperatures can easily exceed 100 degrees F.
The Carl T. Hayden Veterans Affairs (VA) Medical Center in Phoenix, Arizona, helps to heal ailing military veterans, serving about 80,000 patients per year. Now the center is also helping to heal the environment, with the installation of 18,000 solar panels to supply 28 percent of its power needs, displacing greenhouse gases. Capable of producing 4.4 megawatts of renewable power, this installation is said to be the largest solar carport installation in the United States. The renewable energy it produces will displace about 9.3 million pounds of greenhouse gases per year that would otherwise have been created from conventional energy sources to meet the VA hospital's needs, equal to the greenhouse gas emissions resulting from powering 850 homes for one year. The carport covers roughly seven acres, or the equivalent of just over five football fields, and it provides shade for all parking stalls—a total of 1625 vehicles in an area of the U.S. where temperatures can reach over 118 degrees Fahrenheit. In fact, there is so much demand for shade in Phoenix that some companies charge vehicle owners to park their vehicles in the shade. The project also added 135 parking stalls. Costing approximately $20 million, the two-phase project was constructed by SunWize Sustainable Energy Group, which has been awarded several VA contracts to construct solar projects at government medical facilities. In addition to medical and environmental benefits, this and other solar projects installed by SunWizefor the Department of Veterans Affairs also provide economic benefits. That's because SunWize has made an effort to work with Service-Disabled Veteran-Owned Small Businesses (SDVOSB) to construct these projects. The company's main contractor on the massive Phoenix project was local, veteran-owned contractor, Sand Dollar Construction. "SunWize recognizes the importance of supplier and subcontractor diversity as a critical business issue for our company," says David Eveland, vice-president of sales and marketing for the Sustainable Energy Group at SunWize. "We are committed to ensuring that it is an integral part of the strategic sourcing and procurement process in our Sustainable Energy Group. SunWize proactively identifies, builds relationships, and purchases products and services from small businesses, providing them with opportunities to participate in subcontract awards." The Phoenix project has opened doors for SDVOSB contractors to bid on additional solar projects being done by SunWize. "Currently SunWize is subcontracting several Small Disadvantaged and Veteran Owned Business Enterprises for other VA projects throughout the U.S.," says Eveland. "We are subcontracting the same veteran-owned contractor we used for our Phoenix project—Sand Dollar Construction—in our Loma Linda, California, project. "SunWize understands the importance that the VA contracts SDVOSB in their projects, and we work to achieve the highest level of participation possible," added Eveland. The Phoenix VA hospital solar carport project is part of a federal program launched by then-President George W. Bush, in 2007. Bush mandated the Department of Veterans Affairs to improve energy efficiency and reduce greenhouse gas emissions via renewable technologies by either three percent per year or 30 percent by the end of 2015. The VA is using a variety of renewable energy sources to reach these objectives, and solar is one of them. SunWize built one of the first installations for the VA under this program at the Dallas, Texas, VA medical facility in 2009. Eveland says the company has been involved in numerous solar carport, roof mounted, and ground mounted installations for the VA over the past four years, with other significant projects including medical facilities in Amarillo, Texas; Loma Linda, California; Oklahoma City, Oklahoma; and an upcoming project in San Antonio, Texas. 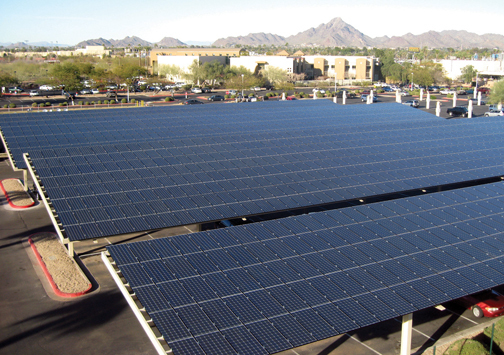 Power generated by the solar carport installation at the Carl T. Hayden Medical Center in Phoenix is fed directly into the hospital medium voltage system. As the solar power is absorbed at the facility, the facility demands less power from the grid. The percentage of demand reduction from the utility depends on the weather, which of course dictates the amount of solar power generated. for solar arrays in hot climates like Phoenix. The arrays are well exposed to airflow, so they operate at the lowest possible temperatures; therefore, they produce more power. SunWize selected monocrystalline Sanyo modules for phase one and Samsung modules for phase two of the project; monocrystalline modules operate more efficiently at high temperatures than competitive multicrystalline modules and turned out to be the best value at the time of this installation. "Sanyo was selected for phase one because its solar panels have a higher efficiency, which allowed us to squeeze more output from the provided parking area. The technology in the Sanyo product also lends itself to better performance in high ambient temperature conditions," says Eveland. Sanyo has since been bought by Panasonic, as part of Panasonic's desire to have an increased focus on solar panels. By its 100th anniversary in 2018, Panasonic has said it aims to be the number one green innovation company in the electronics industry. Satcon provided the inverters for phase one. Eveland says Samsung was selected as the solar panel provider for phase two because it also provides a product that works well in high heat conditions, and the pricing provided the best value. The recently completed phase two component contributes 3.8 megawatts to the total 4.4 megawatt installation. Both phases are 10 degree, fixed mount systems. Eveland says an investigation into using tracking systems showed that it was cost prohibitive for this carport application—despite the output benefits of trackers. SunWize Sustainable Energy Group works with Service-Disabled Veteran-Owned Small Businesses (SDVOSB) to construct solar projects. The company's main contractor on the Phoenix project was local veteran-owned contractor, Sand Dollar Construction. The phase two racking was supplied by Professional Solar Products and the inverters were provided by Advanced Energy. "In addition to the inverters, Advanced Energy supplied prewired enclosures that house electrical switchgear and transformers; these install quickly as a single assembly," explained Eveland. "These assemblies are factory-tested and reduced field construction time and disruption to the facility. Further, this compact design was necessary to achieve the VA's goal of not eliminating parking spaces, and to not disrupt patient services during construction, with components required for this installation or during construction. "We did our work at night," says Eveland, "and no parking spaces were used, lost, or eliminated. Wherever possible, we used underground boring technology as opposed to trenching to minimize patchwork in the parking lot. Mostly, we only introduced small holes every so often as entry and exit points of the electrical infrastructure installed via underground boring." Eveland adds that working around the medical facility's busy environment was one of the major lessons that SunWize learned on this project. "Every day, the parking lot was full by 9:00 or 10:00 a.m., so we learned how to install roughly 400,000 square feet of structure in these busy parking lots without interrupting the hospital operations," he says. "We did that very successfully but it required a tightly coordinated effort with the VA operations team and our subcontractors. It also required us to take on a broad scope of work including demolition of decommissioned facilities and construction of new parking lots. For example, temporary housing had to be found for staff when these buildings were decommissioned to make way for additional parking and solar carports. Also, existing electrical infrastructure had to be upgraded." Given the variety of activities that take place at the busy facility, SunWize also provided the VA with about 10 different design options to take everyone's needs into consideration. It took careful coordination with facilities and energy managers at the VA medical facility to implement the project to complement other construction projects that were underway and anticipate construction plans down the road. SunWize was able to repurpose some of the existing infrastructure in the new solar carport installation and improve upon it. For example, the site had existing canvas carports to provide shade at the facility; these needed periodic replacement, at a considerable expense to the VA. SunWize was able to repurpose the existing concrete bases to support its solar installation and provide energy generating shade for vehicles. Eveland says the VA's hospital solar carport projects are just one example of a rapidly growing market for solar powered installations on carports. He says that many companies have come to realize that parking lots and standard carport rooftops are essentially unproductive and underutilized space that can instead be used to power their facilities with solar energy and reap economic and environmental benefits. "It's becoming extremely popular because it uses under-utilized real estate assets, can use existing carport structures, results in easy to maintain solar, and results in cooler, more efficient solar array operation," says Eveland. "Solar arrays on rooftops are mounted close to the roof surface, so heat is trapped and the solar arrays run hotter; this is not as ideal as a carport installation with freely flowing air cooling the solar modules." He adds that there are more requests to include electric car charging stations with these installations, given the growing number of electric-powered cars on the road and the number of electric power support vehicles used in a facility like a VA hospital.